Relief may be on the horizon for Angelenos and the cars they love. 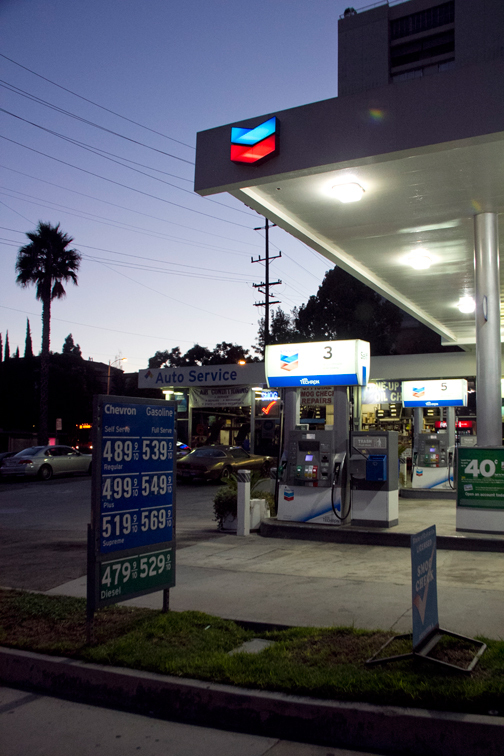 Record-breaking gas prices that prompted a California representative to call for a federal investigation of the oil industry have begun to slow. 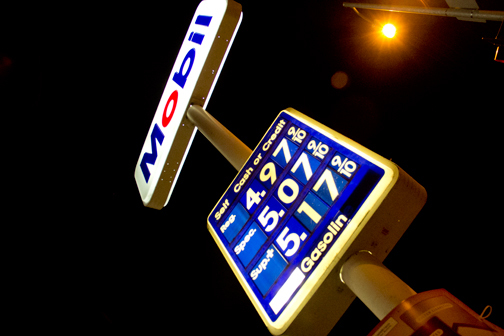 According to the American Automobile Association, average prices in the city of Los Angeles are holding at an average of $4.90 per gallon. Some areas in the city have seen prices climb well above $5 and still other areas have hit $6 per gallon. The automobile club says that California car drivers are currently paying more on average than others throughout the country. A Reuters story posted to Yahoo! News on Oct, 10, said that prices began to surge the previous week when “ … a series of refinery mishaps pinched supplies,” and because of “ … a possible ‘short squeeze’ that came about when a big refiner was forced to buy fuel … ” . Senator Dianne Feinstein (D-Calif.) apparently didn’t buy that argument; she has contacted the Federal Trade Commission (FTC), which has oversight of the oil and gas market in the U.S., twice in the past two months, asking them for immediate action. The “malicious and manipulative trading activity” Feinstein referred to in her letter was the state’s energy crisis back in 2000-2001. According to the Federal Energy Regulation Commission, the Enron Corporation was responsible for real and imaginary energy shortages, with rolling electrical blackouts throughout the state that left more than 100,000 businesses and residential customers in the dark. Enron “used the fear created by the blackouts to push large California businesses into more than $1 billion in long-term energy contracts,” wrote MarketWatch Magazine in May of 2002. 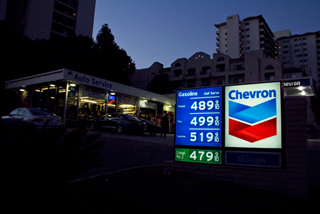 Feinstein called on the FTC “to immediately initiate an investigation” into whether the Tesoro Corporation, which was short on supply and thus unable to meet the demand for gas, had been “squeezed” by other companies; seek data sharing agreements that will allow it to monitor gasoline and oil markets actively and effectively; and that the FTC establish a permanent gasoline and oil market oversight unit. Locally, small business owners and regular folks have also felt a sting at the gas pump. Keeling says he understands that his suppliers “have to survive too.” “A business can write it off [higher fuel prices] as an expense, but what about the average person? They can’t write that off, it’s just a loss. It cuts into their bottom line and they have to start cutting back on certain things,” he said. Like visiting relatives and “hanging out.” Maria Muniz, an organizer with the Community Coalition, says that is one of the adjustments she’s had to make. Since the increases in the cost of gas, Muniz says she’s “had to do more planning ahead to visit relatives in San Bernardino. I can’t just pick up and drive out there anymore. I remember when $20 filled up a tank; now that doesn’t even make a dent, and I have a small car. I wanted to buy a sport utility vehicle for more convenience and more comfort for my family, but these gas prices have made it not worth it,” said Muniz. Muniz, who lives in the Florence-Broadway corridor, said she had also been walking more, choosing to go to local convenience stores to shop instead of driving to Food 4 Less or Ralphs where she usually buys her groceries. Like most people, the grocery stores she frequented were two to three miles from her home. Muniz had hoped to save gas but she found out the hard way that the prices in her local convenience stores were higher than if she had driven to the larger stores. The Community Coalition, based in the Vermont Knolls area, is a membership organization founded by Congresswoman Karen Bass in 1990, to involve grassroots residents in creating, influencing and changing public policy. The organization provides a transportation service for its members to its own meetings and meetings with policy makers around the city, and Muniz and other organizers say the numbers of members requesting the service have increased. Jackson says the current crisis has “affected me tremendously” because, unlike most businesses, Jackson Limousine is unable to pass the higher costs of fuel onto its customers. “We have clients who want to pay no or low money, and we’re competing with companies that have money, who do this [limousine services] as a hobby, as a tax write off; they underbid you for shows. Even some of the celebrities, if you don’t quote a rock bottom price, they won’t use you. Some of them have the money but use it for other things,” said Jackson. Underbidding is only one problem companies like Jackson’s face. “Sometimes, large clients may pay you in a month if they pay you, and we have to carry that debt until we get paid. Some celebrities run up a bill and don’t pay at all.” An increase in the cost of fuel to companies that are already carrying debt from clients who have not paid for the services is unhealthy, to say the least. In spite of such circumstances, Jackson feels that the company is “truly blessed” and is thankful for being in the business for 35 years. He says that regardless of the current gas price crisis, his company is planning to continue its tradition of giving back to the community by having their annual Thanksgiving turkey giveaway. He says that in spite of company problems like gas hikes and negative clients, the turkey giveaway provides hope to the community.